The evocative image of three Greek temples standing in the fields of poppies is not easily forgotten and makes the treck to the archelogical site of Paestum	well worth the effort. 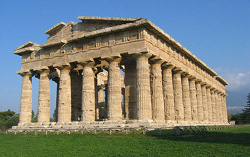 The temples are among the worlds best preserved monuments of the ancient Greek world, remnants of Magna Graecia, as the Greeks called there colonies in southern Itlay and Sicilia. The samll town is close to some of Italys better beaches and just south of where US forces landed in 1943. Paestum	Paestum or Poseidonia as the city was first known, was founded in the 6th century BC by Greek settlers from Sybaris, on the Golfo di Taranto farther east. Conquered by the Lucanians from Basilicata in the 4th century BC, it came under Roman control in 273 BC and it became an important trading port. The town was gradually abondoned after the fall of the Roman Empire, period outbreaks of malaria and savage raids by the Saraceans in 871. The temples were rediscovered in the late 18th century by road builders who subsequently ploughed right through the ruins. The road did laittle to alter the state of the surrounding area though, which remained full of malaria swamps teeming with snakes and scorpions, until well intot he 20th century.